Order the freshest, locally grown Perth flowers online here for same day delivery! INJECT MORE BRIGHTNESS INTO YOUR DAY WITH A WHIMSICAL BUNCH OF BEAUTIFUL BLOOMS FROM THE FLOWER RUN. Each day we choose the most beautiful fresh flowers we can find. Jump online, order a bunch, and we’ll do the rest! For the season’s best WA flowers carefully selected, artfully arranged, and delivered to the door, you can’t go past The Flower Run. We also offer a floral subscription that brings the freshest blooms from the Perth flower market straight to your doorstep on a weekly or monthly basis! The Flower Run donates $1 from each and every flowers Perth arrangement to charity, so the moolah for your little bunch of happiness stretches even further! (We share the love around and choose a different charity every month). WE ARE A PERTH ONLINE FLORIST SPECIALISING IN SEASONAL, LOCALLY GROWN FLORAL ARRANGEMENTS. Delivering fresh floral goodness on our daily “Flower Run”, our creations are relaxed and modern with a simple aesthetic – we let the blooms do the talking! Alyssa, our chief flower-runner and florist, picks the best local flowers fresh from the markets and arranges them with a keen eye, lots of love, and a distinct sense of fun. The Flower Run – The best place to get your Flowers Perth online. Whatever you choose, rest easy knowing you’ve got the season’s best flowers; picked, arranged and delivered daily! Treat your bestie, your mum, your lover, or yo’self! 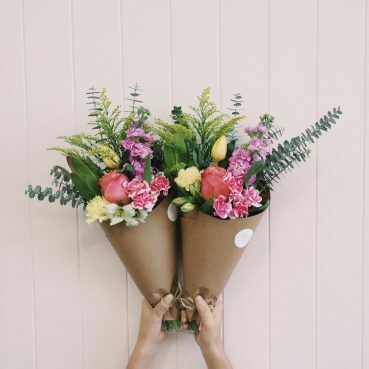 The Flower Run’s convenient Perth florist delivery service will deliver some bloomin’ great vibes whenever you need them – order by 1pm or until sold out for same day delivery.